President’s Day weekend was filled with rain, rain, and more rain. The storms caused flash flooding island wide, and we gladly accepted these days as lazy days. Thankfully, Curtis’ command gave them Tuesday off as well for “good behavior,” so we used this sunny day as our chance to get out and explore. Knowing that every trail would be muddy, we opted to go for an easier hike where muddiness wouldn’t preclude us from reaching the end. On the road by 7, we started heading toward the North Shore, passing by the perpetual traffic jam leading South into Honolulu. We are so glad that we almost never have to deal with that. As we drove North, the urban sprawl slowly gave way to the fields and country of the valley. The Wai’anae Mountains were cloud free and we could see Ka’ala clearly today. We followed the base of the mountain North and West until the highway ended near the ocean. It was about 8 by the this time, but there were only a couple cars and a pair of bicyclists at the trailhead so we headed off towards the Northwestern tip of Oahu. 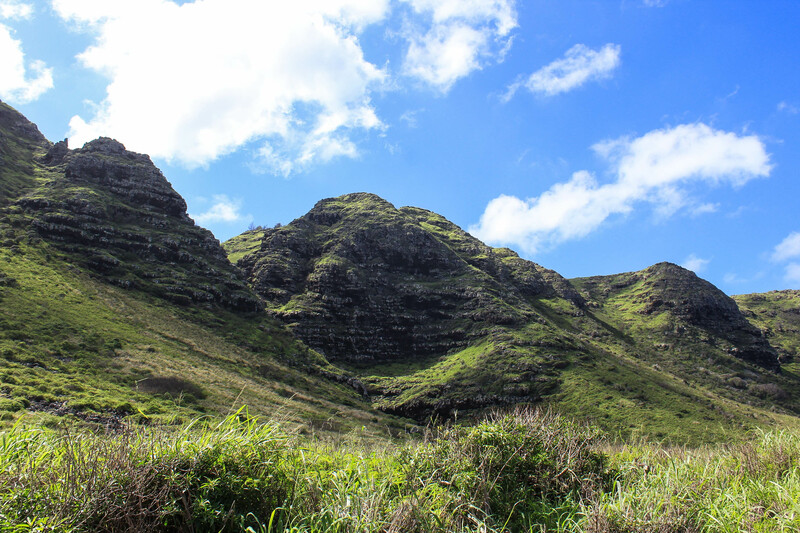 The trail to Kaena Point is actually the extension of the Farmington Highway and frequented by 4×4’s and off-road vehicles. However, because of the excessive amount of rain over the weekend, the road was closed to vehicles. And for good reason; the road was a mess of water-filled pot holes and muddy ruts. But we anticipated this and were able to maneuver or way around with mostly dry feet. 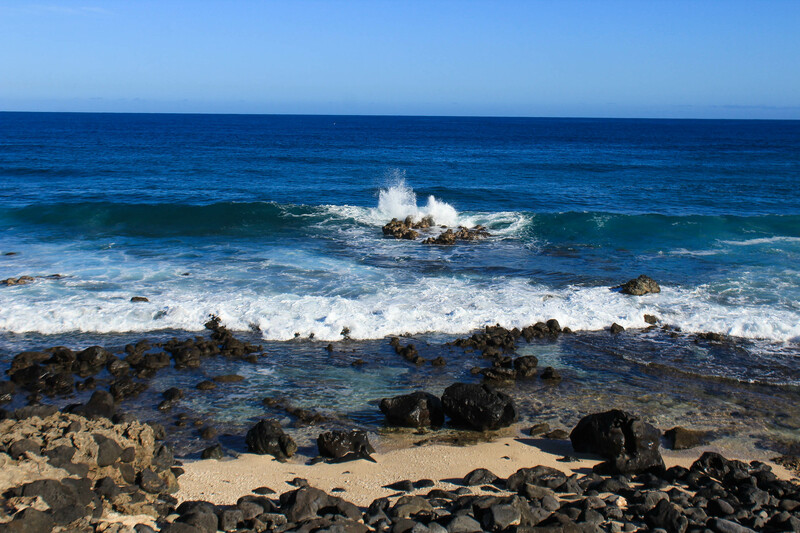 We stopped to grab a letterbox, and frequently admired the crashing surf. The North Shore is known for its waves, and winter is often the time for some of the biggest. Kaena Point specifically has been known to see some monsters: i.e. 60-80′ tall waves. But since we aren’t surfers (yet?) we were more interested in the canyons that cut deep into the mountains. Deep gashes that cut into the high green cliffs. We only saw one trail leading off into the mountains, but that’s a good enough reason as any to return for some back country exploration. Along the hike, a male Kalij Pheasant (non-native introduced species of game bird) with a bright red head and pretty coloration ran across and along the trail. As we approached the point I happened to look out over the ocean and saw a tell tale spout and tail slap of a whale. (That makes 2 sightings!) Animal sightings turned out to be the theme of the remainder of the hike. Soon the road ended at a blockade of boulders, but the trail continued on to a tall predator fence designed to keep rats, cats, mongoose, and dogs off of the point and the wildlife sanctuary that it encompasses. As we continued through the preserve to the actual point we noticed many white birds that we thought were large seagulls at first. We stopped to read some of the informational signs describing the importance of the preserve and the success that has been seen here. 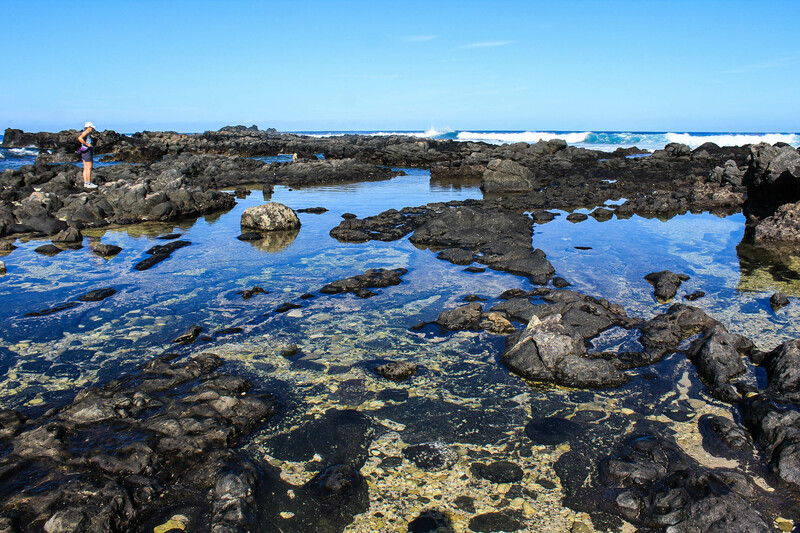 The preserve was set up to help revitalize the seabird population on the main islands after introduced predators and human interaction had forced native species almost exclusively to the Northwestern Hawai’ian Islands. 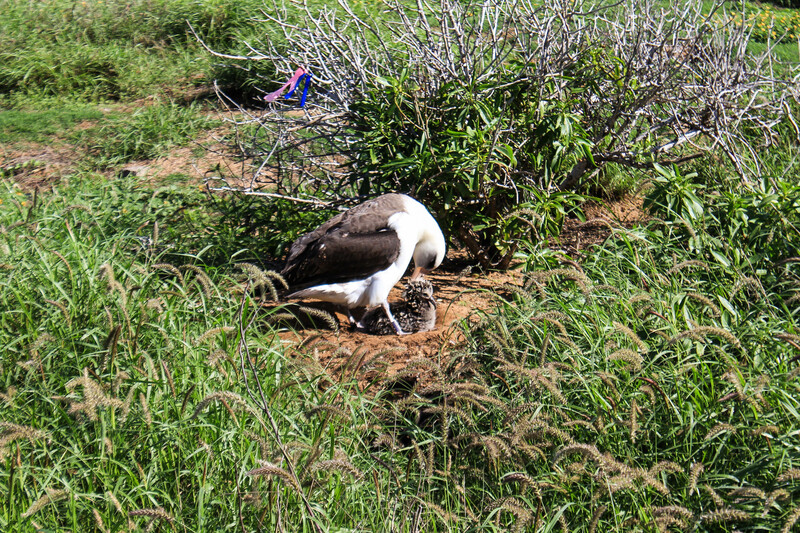 The large birds we had seen were actually Laysan Albatross, a non-threatened species but a Native species nonetheless. 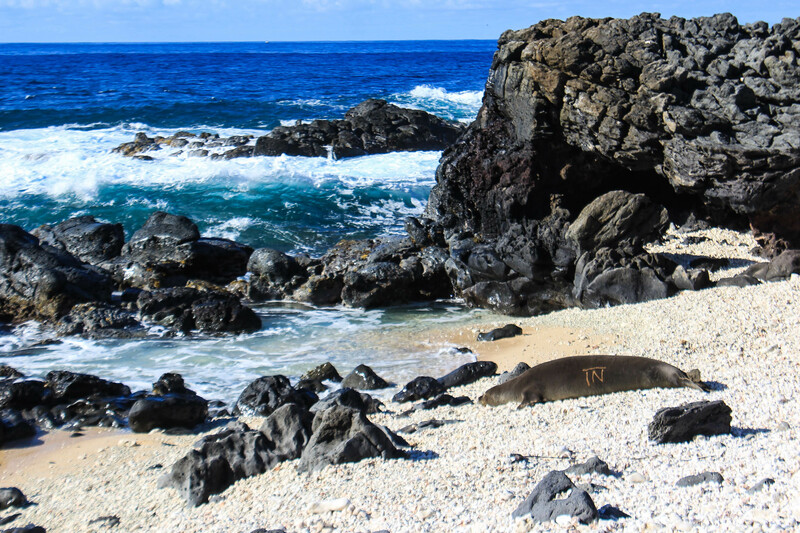 Another native to Hawai’i, and one of only two native mammals, the Monk Seal is an endangered species with less than 1500 seals left. We took our pictures and kept our distance. Later, at home, we made a seal report to NOAA who informed us that (based on a bleach marking) this was ‘Rip,’ a 15 year old male. We continued down to the rocky coast and the tide pools and looked around. We saw plenty of small fish and crabs in the pools, and we spotted a red striped cleaner shrimp and a pair of sea cucumber. We then sat, ate an apple, and admired the sea and the view of the Wai’anae Mountains. As more people arrived, we decided it was time to go and headed south towards the other end of the predator fence. Along the way, we passed an Albatross just off the side of the trail. We took the opportunity to take a picture of it, and while taking pictures she shifted in position, revealing a fluffy grey chick underneath her. Of course, it’s funny to call this ball of fluff a chick since it’s about the size of a grown hen. We then returned back the way we came. Dodging mud puddles, finding a couple more letterboxes, and always wondering about those peaks and canyons nearby. We passed a fair number of people on the way out, and the parking lot was full when we got back to the car. Just goes to show, always go early on Oahu. (Unless it’s a popular place for sunrises, then don’t). Altogether, this trail was 5 miles round trip, and we took about 3 hours including time spent at the point admiring the wild life. 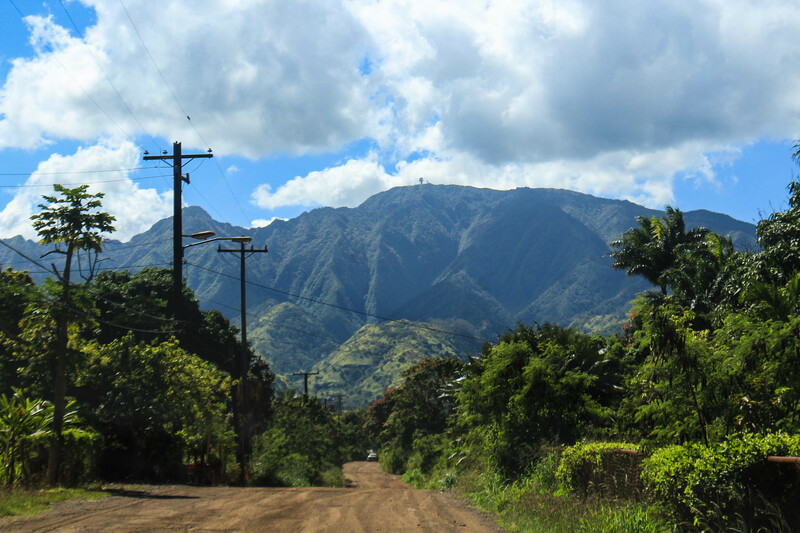 We decided to drive through the town of Wai’alua, keeping our eyes open for the Whispering Giant statue that went missing. Rumor has it that it’s on someone’s property, but that was ten years ago. More research is needed for sure. We drove over to the more touristy town of Haleiwa for some shaved ice cream, only to find our favorite food truck closed for the day. We decided to branch out to some of the more popular shaved ice at Matsumoto’s Shaved Ice shop. It’s no shaved ice cream, but it was still tasty. I’d like to ask Mr. Matsumoto if he knows where the giant is. He’s been here since the 50’s supposedly. We found a couple of boxes in town and then decided to head home taking the Kamehameha Highway over the North Shore, a drive we hadn’t done since before we moved into our home. Drives like this remind us that there’s still so much more on this island that we have to explore, and we are looking forward to finding more remote and less popular spots.